Long known as a delicious traditional Italian restaurant, Tartufo with its new location attracts a flock of beautiful people and serves up exquisite cuisine. The restaurant is set on two floors each with a warm, cosy ambience and kitted out in a smart contemporary style. The downstairs dinning room is especially welcoming and intimate. You can taste the passion here at Tartufo. Both dining rooms are pleasingly chic, spacious and perfect for both business meals and romantic evenings. With its modern décor, exceptional cuisine and swift, discreet waiters Tartufo is a real winner! Smartly dressed staff provide a consistently friendly, and professional service. There is a wide selection of cocktails. The enticing Tartufo, with its sharp modern decor and delicious modern Italian food, invites you to throw the best bash or the most perfectly memorable gathering on-site at its home. With its two floors it�s a very flexible venue for private and corporate parties. 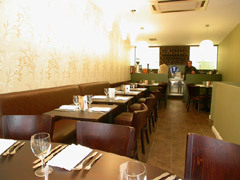 Exclusive hire is available on request and you can be sure to enjoy the unbeatably warm welcome and friendly atmosphere. The menu is a skilful combination of simple modern Italian and traditional regional recipes using fresh and well-sourced ingredients. The chef here pays exquisite attention to detail. Pasta is always homemade, excellent fish dishes, many veggie options and mamma mia desserts. The wine list concentrates on mainly Italian wines. Excellent food and good quality wines. Good value for money and good service. This restaurant has become my regular.